Inside the MEU is a feature that provides insights and details of a MEU event that has happened recently. For this edition’s feature, we present you with an overview of the 5th Edition of Model European Union Vienna, which took place in Vienna, from 22-25 February. 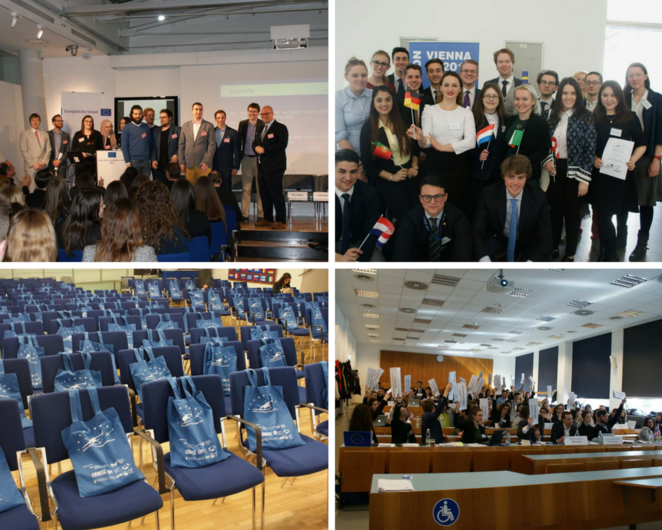 This year’s Model European Union Vienna took place in the buildings of the Technical University (TU) of Vienna for the first time and brought together 112 participants from 42 countries. Catalina Buse emerged herself in the MEU world for the first time as a volunteer. She stated that “it was really interesting to observe the diverse personalities of such a big event and how much “soul” the participants and the whole team put into it”, and when asked to chose 3 words to describe the event she underlined “involvement, people and learning, and please let me add the fourth “fun”. In MEU Vienna participants who play the role of journalists like Rina Halimi did, keep a dairy on social media and at the end of the day the gathered information is printed on the daily “JEUrnal” newspaper. Rina stated that the team of jEUrnalists would “ask intentional political questions just to spice things up” and that “this is a task where you get all that “behind the scenes” advantage”. She further explained us that “the journalists’ team is assigned to be responsible of the flow of the debate in the parliament as well as in the council, do interviews with participants and also to pay attention to different situations in order to produce some rumours. Model European Union Vienna 2018 was one the best opportunities I have ever experienced”. Plamen Patchev, one of the organizers, when asked to pick a novelty that turned out to be a success in this year’s edition, said that “In 2018, for the first time, we recruited our chairs via an open call and structured interviews and we are glad to say that the selection has been proven very successful”. Suzana Pecin was one of those selected Chairs, a role she played for the first time. She shared with us that “It was excellent. The Ministers of the EU Member States were highly productive and aimed at constructive debates on the topics concerned, submitting the amendments which are a clear result of understanding the complexities of the issues. This allowed me not only to upgrade my knowledge on the substance we were discussing, but to embrace the role I was given as the President of the Council”. Suzana also believes that “MEU Vienna is not just an ordinary simulation” and further elucidated that “it is a way of making the EU a better place. People involved are making a change in this world by raising issues on important questions such as those we discussed”. We asked Ondrej Woznica, who palyed the role of a member of the Council representing the Netherlands, an example of what did participants discussed during the sessions and Ondrej replied “We’ve discussed new ETS regulation reacting to Paris Accord and proposal of the European Defense Industrial Development Program”. We also asked him what was unique about MEU Vienna and Ondrej answered: “What really surprised me was the atmosphere and people I met there. I couldn’t believe that people from across whole globe were negotiating with me in the very same room. I personally consider this the best part of MEUs and simulations like that: making new friends and connections. I believe that what made the Vienna simulation unique was the organizing team, which managed to organize an amazing event and I definitely am going there next year as well!”. From the statements of the participants it is very easy to apprehend that MEU Vienna was a success. So we asked the organizers for some advices on how to craft a triumphant MEU Conference. On a final note, we would like to thank all the organisers and participants who took a bit of their time to share and answer our questions so promptly and enthusiastically. We hope that this edition’s feature of MEU Vienna has motivated you all to start taking part in MEU Conferences actively or to continuing doing so.